Rancho Sentosa is an unique property situated just minutes from the beaches of Fuengirola & the "White Village" of Mijas. This charming property is perfect for 2 couples that want to holiday together yet have their own private space or families with older children. There are two, one bedroom apartments located next to each other ... the 'Pool' apartment and the 'Rock' apartment. Both beautifully decorated for comfort and relaxation. The owners live on the property when not away on their travels and are more than happy to offer advice or help if required. The pool and spacious gardens are for the exclusive use of both apartments. The properties are not linked internally and the owners have a separate entrance. Guest Apartment 1: sleeps 2 in 1 x super king bed (zip & link) + ensuite shower-room, lounge with sofa & TV and small kitchen. Guest Apartment 2: sleeps 2 in 1 x king + ensuite shower-room, lounge with sofa & TV and small kitchen. All the above rates are for a maximum of 4 guests + an infant in a cot/crib (hire of cot/crib is extra) and includes: pool maintenance, gardener & all linen/towels (including pool towels). For bookings up to 10 nights the maid service will be on your day of arrival and day of departure only. Bookings for 11 nights or more will also have a mid stay linen/towel change and clean. We don't take a damage deposit, but in addition to the above rates there is a mandatory accidental damage waiver (ADW) fee of £10.00 per person, per booking. This is to cover you for any accidental damage that may occur in your property during your holiday, this will cover you up to the value of £150.00 per person. A 25% deposit is required at time of booking with the balance payable 10 weeks before occupation. The first apartment, known as the 'Pool Apartment' consists of an air conditioned bedroom with an ensuite shower room. The super king bed is a zip & link and can be separated if you choose. The air conditioned lounge has a comfortable sofa, internet and an IPTV system (internet TV) offering many channels in many different languages. The kitchen is equipped with a microwave grill, fridge with a small freezer compartment, double electric hob (stove tops), cafetiere, toaster, juicer etc. The second apartment, known as the 'Rock Apartment' consists of an air conditioned bedroom with a king size bed and an ensuite shower room. The air conditioned lounge has a comfortable sofa, internet and an IPTV system (internet TV) offering many channels in many different languages. The kitchen is equipped with a microwave grill, fridge with a small freezer compartment, double electric hob (stove tops), cafetiere, toaster, juicer etc. Rancho Sentosa is your own relaxing oasis set is lush, tropical gardens perfect for you to while-a-way the day. At Rancho Sentosa you'll be spoiled for choice as to where you'll relax on your vacation. Will it be around the pool soaking up the sunshine or relaxing in the comfortable seating area outside your apartment with a glass of Rioja in hand. Alternatively enjoy the use of the shaded summer kitchen area barbecuing some fresh seafood. Fish is so plentiful and fresh here in Spain and the fish & sea food counter in the supermarket at Corte Ingles has a fabulous choice. If seafood is not your thing the meats are also excellent in particular the Iberico pork is very good, ribs in BBQ sauce are a particular favourite of mine. The wines of Spain are fantastic and they like to keep the best ones to themselves. What a better way to spend an evening than to sample different Riojas and Cavas while watching the sun setting on a warm Spanish evening. 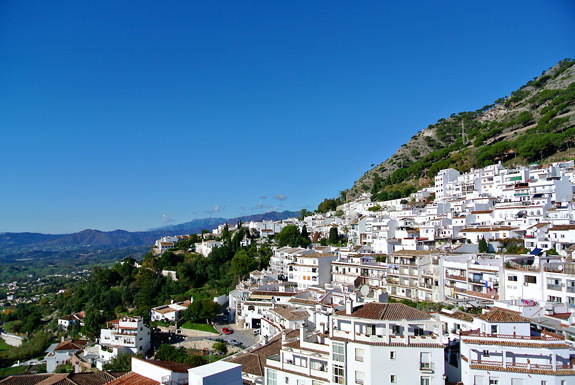 Rancho Sentosa is ideally located for easy access to the picturesque and vibrant village of Mijas with its narrow streets, quaint shops and friendly restaurants. The Mirlo Blanco (see our restaurant guide) takes pride in the food it serves. One of my favourite dishes is the crab, served hot in it's shell. I also highly recommend the house specialty Souffle ... delicious! Within walking distance of Rancho Sentosa is restaurant Villa Linda and just a little further Casa Navarra, a fantastic traditional Spanish restaurant that specialises in great steaks - see our restaurant guide. 'Lew Hoads' famous tennis club is only a few minutes away by car and a fun filled day at the Aqua Park in Fuengirola is just 5 mins. Less than 10 minutes away are the long sandy beaches, lively bars and nightlife of Fuengirola. The promenade is peppered with beach bars and restaurants and you can take boat trips from the marina. Fungirola's pretty harbour has many restaurants to choose from and is the perfect place to people watch while enjoying a leisurely lunch. With large sandy beaches and a colourful array of sights the Costa del Sol is a beautiful region of Andalusia to visit, ranging from the the lively and cosmopolitan to the peaceful and traditional, its here for you on the Costa del Sol.